There is such a wide variety of birds that you may want to consider what type you want to attract. When considering building or purchasing bird houses, you have to remember that there are predators like cats and snakes who are able to climb trees. You might want to attach your bird house to a pole to keep the birds safe as well as being difficult for predators to reach them. Bird houses should be sized for the bird or birds you want to nest there. The houses should have holes inthe bottom so that waste and water don’t remain inside and are able to drain out. Holes will also keep the houses cleaner. The best material for outdoor bird houses is wood, the natural product that will deter insects. The opening to the house should be small enough to deter predators. If the front of the house can be opened, perhaps made with hinges, you can check inside more easily. You might want to have an outdoor enclosure, an aviary for your pet bird(s). There are a variety of ready-made aviaries available at your pet supplier’s. They can be made from wire, wood or plastic or a combination of these products. Or you may opt to build your own aviary. Check plans on building an outdoor aviary. Your hardware store can supply you with all the necessary materials. Make sure the bottoms of the cages are secure so no predators can get in. You will need a solid roof, plastic or wood and perhaps one solid side to protect your birds from the elements. When considering an outdoor aviary, keep in mind the climate of your area. 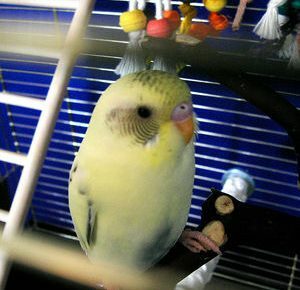 If winters are cold, you will need to take your birds indoors. I’ve cut willow branches for use as perches and branches from fruit trees can be used as well. 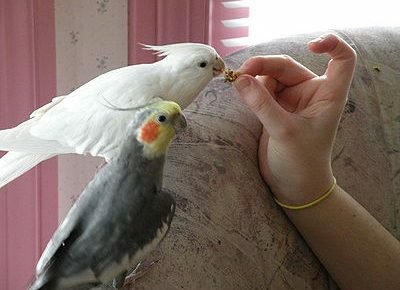 Include toys for birds in your aviary. And you’ll need sturdy dishes and a hanging water bottle for food and water. Feeders placed outdoors will attract many birds. Again, beware of predators and try to attach your feeders to poles. You can purchase ready-made bird treats or string popcorn and cranberries on branches. You can use the mesh bags that fruits and veggies come in, putting suet (raw beef or sheep fat) filled with cornmeal, peanut butter, bird seed, raisins, oatmeal, pieces of apple and unsalted nuts. Melt the suet, add the other ingredients, let harden, place the mixture in the mesh bags and hang outsie. This is a great treat for birds. You can also hang corn with shucks pulled back outside. Pine cones spread with corn meal, peanut butter and bird seed is another treat. Birds will enjoy pieces of fruit too. 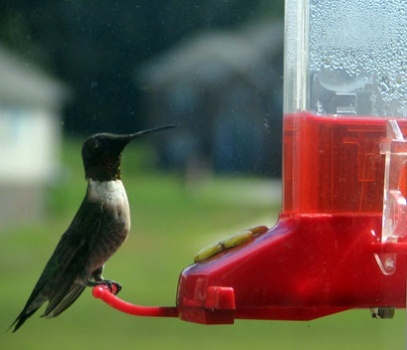 Feeders are especially helpful in cold weather when food is scarce. Birds will need a water source too. If you leave a dish of water outdoors or have a bird bath, in winter check to see that the water hasn’t turned to ice. If so, replace it with fresh water. 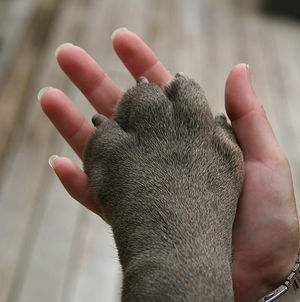 Has Your Dog Changed A Life?